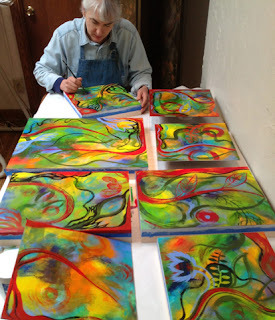 I have been working on eight new acrylic paintings in my “Metamorphosis” series for my exhibit in May. Usually I work on two or three at a time — but never this many simultaneously. It has been interesting to work this way. At first I just wanted to get the color brushed on all of the surfaces (which is how I begin with these). Then I began in earnest on one piece moving my brush strokes from that random stage to making more deliberate decisions allowing my inspiration to guide me. As that piece dried I moved on to another one and so forth. We’ll have to see if progress continues this way or if I end up focusing on one or two at a time until complete. I just picked up some of the art for my upcoming exhibition in Ogden at the Gallery at the Station (in the historic Union Station). These are some of my gouache paintings. 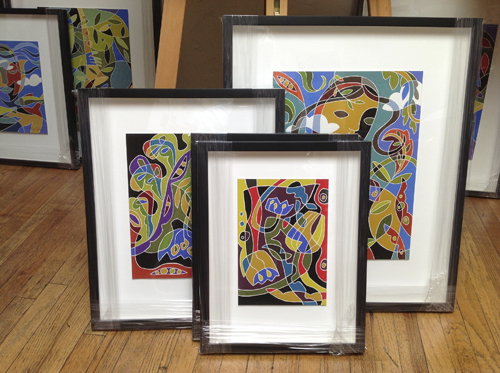 I still have paintings in process but it feels so good to have some finished and ready for the show! The exhibit opens on Friday, May 3rd with an Artist’s Reception from 6:00 to 8:00 p.m.